Just a quick update on our new dresser. 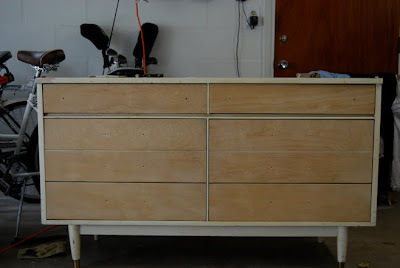 We sanded down all the drawers over the weekend and removed the veneer top which actually came off very easily. We read online that an iron was the most effective way to remove the veneer, we tried that method but actually had an easier time using a heat gun. I think the iron would work well if you had a heavily glued down piece of veneer because the steam would also help lift off the glue but we were able to easily chip away pieces with a few seconds under the heat gun. We picked out some paint chips as well. Initially we liked the darkest option on the chip but now we are thinking that might be too dark. I want it to be a statement piece but that might be making too much of a statement. We are leaning toward scuba green, on the second chip. I could even go one lighter than that on either chip. What do you think? 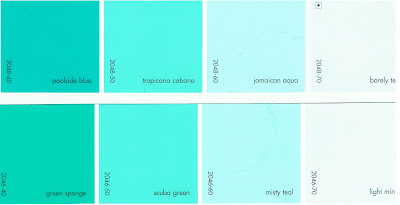 Hey Candice, I was looking at the colors and i'm not sure how accurate they are on my computer screen but it almost seems like scuba geen is brighter than sponge green. sponge green is darker yet seems a bit more subdued. love that you are looking at green/blues. it's so hard to decide isn't it! I see what you mean Sydney! I will definitely have to do some color testing directly on the dresser to see what looks best, especially since the color swatches can vary so much even from the actual paint! I even like some of the lighter options on the swatch. I will keep you posted with what we decide! ooo i love a good dresser redo! so hard to say about paint colors. What are the other colors in the room? I personally would steer more towards the misty blue.